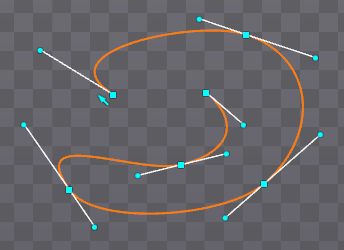 A path is defined as a composite Bézier spline. It is made up of "knots" which are vertices on the path, and "handles" which are vertices that control the curve of the path between knots. Like other attachments, when the bone is transformed, the knots and handles are also transformed. Paths can be used with path constraints to constrain bones to follow the path. 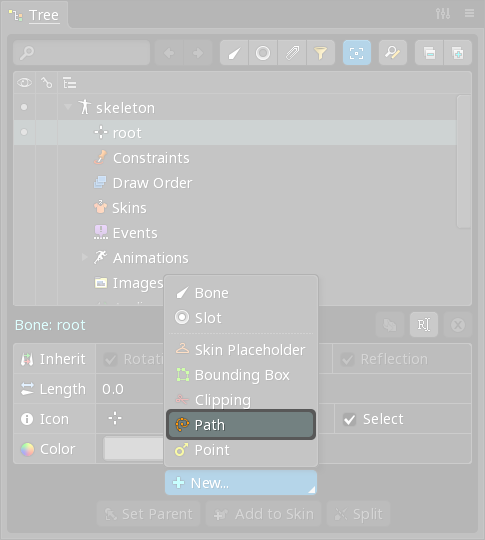 To create a new path, select a bone or slot in the tree, then choose New... Path in the properties at the bottom of the tree. 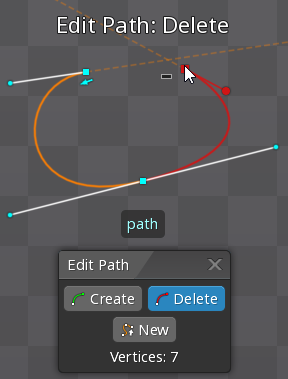 The new path appears in the tree and Edit Path mode is automatically selected. The New mode inside of the Edit Path mode is also automatically selected. 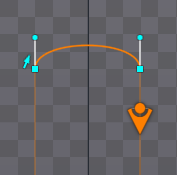 While in New mode, clicking in the editor area will create a new knot and handles. Clicking and dragging will create a new knot and adjust the handles. 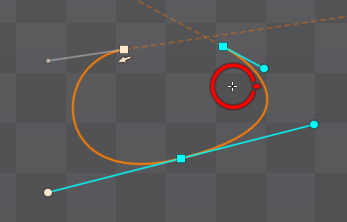 Vertices can be translated by dragging or deleted by double clicking. When the path is complete, exit New mode by clicking the first knot to close the path or by clicking the New button. Create allows new knots to be created by clicking between existing knots. Delete allows knots to be deleted by clicking. 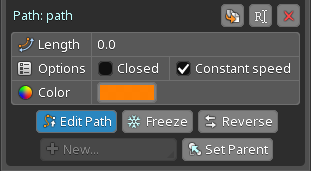 Edit Path mode can be exited at any time by pressing spacebar or escape, by clicking the Edit Path button in the properties at the bottom of the tree, or by closing the Edit Path dialog. The path vertices can be edited outside of Edit Path mode by using the transform tools. The entire path can be rotated, translated, and scaled like any other attachment. When moving a handle, shift can be held to lock the angle of the handle, so it will only move toward or away from the knot. This can be useful to adjust the curve on only one side of the knot. Normally when moving a handle, the handle on the opposite side of the knot also moves. By holding alt, a handle can be moved without affecting the other handle. This results in a cusp, where the transition from one curve to the next is not smooth. When Closed is checked, the first and last knots are connected. When Closed is unchecked, which is the default setting, the first and last knots won't be connected. 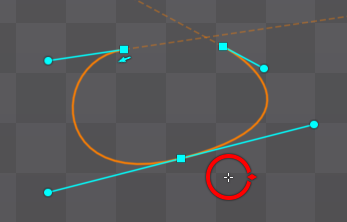 Instead, when an open path is selected, the lines beyond each end will extend to show the trajectory of an object if a path constraint position is smaller than 0% or greater than 100%. When Constant Speed is checked, additional calculations are performed to make calculating positions along the path more accurate. When used with a path constraint, this results in bones moving along the path at a constant speed. When unchecked, fewer calculations are performed but calculating positions along the path is less accurate. The accuracy is worsened when the handles affecting a portion of the path have dissimilar distances to their respective knot. Accuracy may also be worsened if vertices are moved from their setup pose positions using deform keys or weights. Unless performance when calculating positions along the path has proven to be an issue, it is recommended to leave Constant Speed checked. It should only be unchecked when the limitations are understood and the non-constant speed behavior is acceptable. Like keying meshes, when a path's vertices have been manipulated in animate mode, the path can be keyed. Paths can be automatically deformed when bones are transformed. See Weights for more information. For best results, typically the knot and both handles should have the same weights.